There is something romantic about English country-sides, especially early in the morning with mist rising in the valley’s – it’s a wonderful atmosphere. A fabulous photographer, John Robinson captures many such scenes – I love all his work. 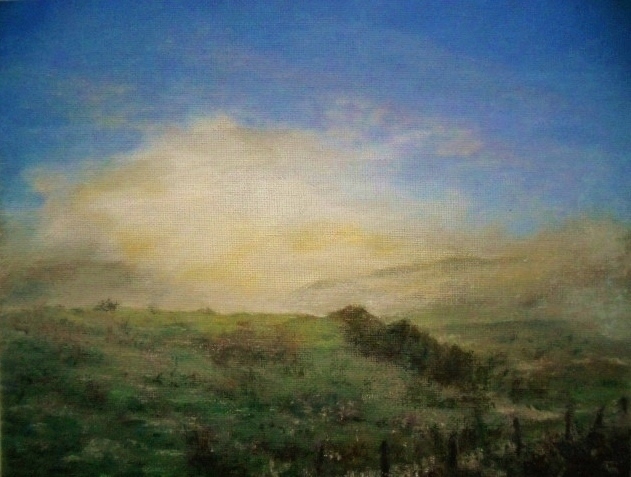 My latest painting, Morning Mist (oil pastel, 8×10) was inspired by one of Johns images. The setting was early morning, with a bit of fog and mist swirling in the valley; just imagine walking the field with the morning chill and seeing the beauty of country-side – the vision would be enough to warm anyone’s soul. Reference image was from John Robinson of pmp. 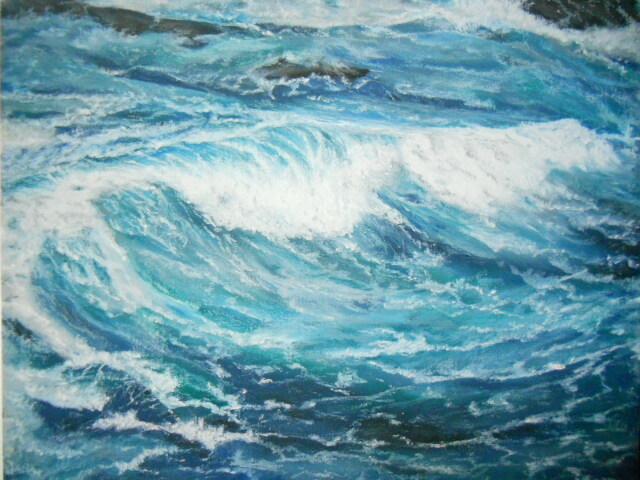 This entry was posted in About Oil Pastels, OPs New Paintings and tagged landscape, Mist, morning, Oil Pastel, painting. Bookmark the permalink. Thank you Cheryl, I really appreciate your nice comments. Appreciate your kind comments – thank you Amira! Morning mist has a faint glow of hopeful expectation, of promise for what might be. Evening fog is the opposite, a conclusion, so the painting of the morning mist is, for me, a delightful painting. Your comments are so beautiful Marylin, thank you so much! Thank you Calee for your beautiful comment. Glad you enjoy the painting – I think it’s the cool mist that rises from the land in the mornings, that brings a certain quietness and beauty. There is an ethereal quality to this one Mary. It’s positively luminous. Thanks Dorann for your nice comment. The scene was from the wee hours, when everything is still a bit out of focus – a little different for me, but enjoyable to paint. Mary! You made me remeber my days in England 🙂 wonderful work, beautiful!!! This is a landscape I recognize and love. And that morning mist – we have it here too. You have captured the feeling when I walk into it…perfectly. Thank you Ann-Christine, it must be pretty amazing to live in an area where you can escape the world and walk into right into these swirls of misty smoke. Thanks and glad you can relate to the scene. Stunningly exquisite! Mary, you have outdone yourself! Absolutely fantastic! Thank you Elena, your generous comments are really appreciated. A little different for me, was trying out a new surface that was more slick but still worked for OPs in the end. Thanks again! HI Patricia, these colors are so bland compared to your vibrant and bold pieces – like a shock right? Thanks for your nice comments, for me this was a quick one. Yeah I agree, thanks Cat! You know I thought about putting some in this piece and then I thought better of it, not having painted one before. Thank you for your nice comment, really appreciated! What a magical vision to inspire you! Thank you – someday I’m going to create a map of all the places my paintings are inspired by. It would be fun to keep a running visual – thanks again! Is that Cat Stevens I can hear? Oh how funny maybe – you’ll have to go and check it out! Thanks Stephen! Thanks Marina for your lovely comment! I LOVE it!!!!!!!!!! I grew up in a spot like this! Oh my, lucky you – I’d love to enjoy a scene like this every day. The English country-side is incredible for painters ~ thanks so much for your wonderful comment! How do you get a whole magical world into an 8 x 10 space? Simply splendid. It is grand to see you fully expressing a fine talent. Hi Craig, your comments are wonderful and much appreciated. I was actually experimenting a bit with a new surface to see how it would handle oil pastels and am satisfied that it will work fine for scenes that have a slightly blurry atmosphere. Thank you so much!